The 3 biggest mobile networks have a special offer to their avid subscribers. The FREE Internet Promo from SMART, SUN and Talk N Text allows prepaid users to get FREE MOBILE INTERNET access with no extra cost! Just maintain an airtime balance of at least P1 or subscribed to any load bucket/promo. With an initial data of up to 30MB, you can now enjoy an all-day access to your favorite Internet sites or apps for free, now with Unlimited Facebook browsing. Stay connected with the world. Get to know the latest happenings on your favorite social networking sites, post your own updates or keep posted with the current events or listen to your fave music, visit your favorite blogs and many more. Promo runs from September 26 until January 5, 2015. Don’t miss this limited offer. To avail of the service, here’s how to register to FREE Internet Promo from SMART, SUN and Talk N Text. Want to know more about the latest Smart, Sun and TNT Promo? Keep updated by visiting us again. You can also check on Smart Telecommunications Facebook Page and Unlipromo FB Page for the latest feeds and more exciting promo. 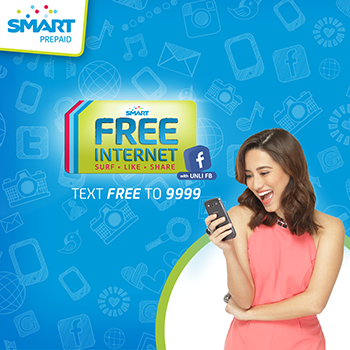 ano magandang promo sa internet sa smat or talk n txt? Globe Prepaid UNLICHAT25 and UNLICHAT 299 – Chat to sawa! Globe Prepaid Powersurf Promo 2013 How to Register, Validity and Price. Smart Prepaid Giga Surf 799 comes with 4.5GB Data and FREE iWant TV subscription.